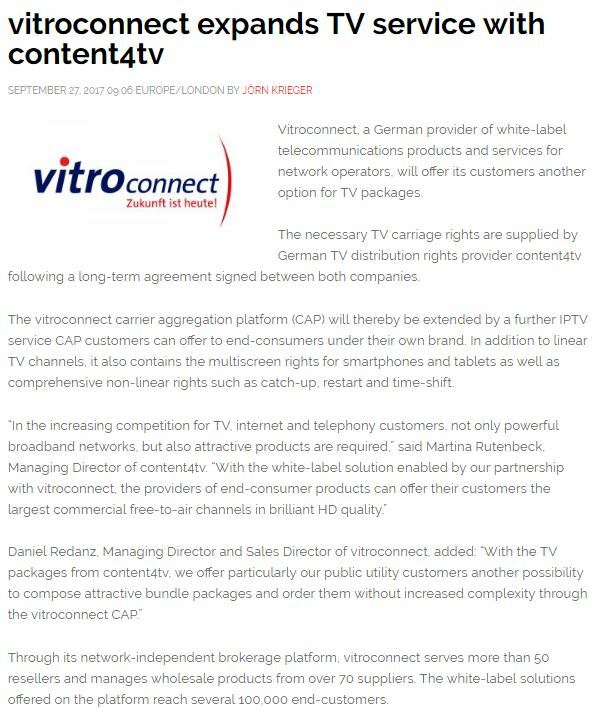 Vitroconnect, a German provider of white-label telecommunications products and services for network operators, will offer its customers another option for TV packages. The necessary TV carriage rights are supplied by German TV distribution rights provider content4tv following a long-term agreement signed between both companies. The vitroconnect carrier aggregation platform (CAP) will thereby be extended by a further IPTV service CAP customers can offer to end-consumers under their own brand. In addition to linear TV channels, it also contains the multiscreen rights for smartphones and tablets as well as comprehensive non-linear rights such as catch-up, restart and time-shift. Through its network-independent brokerage platform, vitroconnect serves more than 50 resellers and manages wholesale products from over 70 suppliers. The white-label solutions offered on the platform reach several 100,000 end-customers.